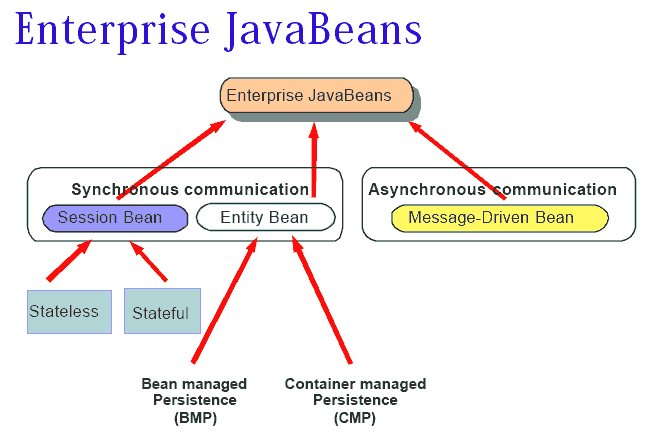 EJB (Enterprise Java Beans). EJBs (Enterprise Java Beanses) are used mainly by large corporations. They are not something to concern the fledgling Java programmer. They are complicated. I can only give an arm waving overview that won’t enlighten much. You have to study them in detail before you even begin to understand what they are for. EJBs are probably the most difficult part of Java. Here is a rule of thumb. If your application is so complicated that it will have to be distributed over several servers, have a look at EJB. If not, use a simpler technology. Enterprise beans don’t have a GUI (Graphic User Interface) interface. Enterprise Java Beans speak CORBA (Common Object Request Broker Architecture) IIOP (Invocation over Internet Inter-Orb Protocol) for their RMI (Remote Method Invocation). Session Beans maintain conversational context for one client. Entity beans cache data for one row of a database. Entity beans also provide a simple persistent object database, indexed by a primary key. The Entity bean learns its primary key at create time and may persist indefinitely. Beans make it easier to implement transaction logic with commit/rollback. The transaction processing logic helps keeps beans from interfering with each other. EJBs use JNDI to find objects. They use RMI (regular or IIOP Corba) to communicate between servers. They use JTA (Java Transaction Application programming interface) for transaction management. The point of EJB is to fob much of the work of concurrency, transaction handling and persistence off on the container so the beans can concentrate on business logic. Beans communicate via two proxy objects, one that implements the bean’s home (bean-finding) interface and one that implements its remote (business-logic) interface. The indirection allows the EJB container to intercept the calls and add functionality such as persistence. EJBs come in a number of flavors. Entity beans are used to represent data in a database. There are two flavors of entity beans, BMP (Bitmap) and ( CMP (Container Managed Persistence)). With CMP the container handles generating all the SQL (Standard Query Language). With BMP you have to write the SQL. A typical simple use-case is that a single instance of an entity bean represents a row in a database. Many people have soured on entity beans and prefer a simpler approach like Hibernate. In fact, the new EJB specifications endeavor to make entity beans more like Hibernate. Session beans are essentially service providers. A typical use-case is to encapsulate high-level business logic. For example, a session bean for a bank might implement an electronic transfer. Session beans can be stateful or stateless. A stateful session bean maintains a conversational state between itself and the client. A stateless session bean does not; a client might get completely different bean instances from one call to the next, even with the same handle. Message driven beans are capable of responding to JMS (Java Messaging Service) messages. (The other types of beans are not able to do this do to the restrictions of the bean container.) MDB work asynchronously, the other bean types are synchronous. MDB can post JMS messages and that can be used as a return value of sorts. Using EJBs gives you a number of things. The biggest thing is the server environment. You do not need to implement all the things that go with a server, like threading, polling, security, etc. Using EJBs also takes away a number of things. You are not allowed to do certain things within the EJB container, e. g., you should not create threads, do file IO, listen on a socket, etc. There are many different ways of using EJB s, sometimes called idioms.